Edward G. Patterson (1866-1945) was a prominent local businessman, politician, and amateur boxer who is best remembered as the owner of the prominent McKenzie Hotel (later Patterson Hotel). He served as Bismarck’s mayor from 1896-1900, as chairman of the Board of County Commissioners, and 26 years on the City Commission. At age 18, Patterson relocated to Bismarck in 1883 from Cleveland. He was a barber, initially working for Sharpess Brothers. He later owned various enterprises before acquiring the Sheridan House hotel in 1893, originally with a partner E.S. Allen. He became the hotel’s sole proprietor the following year. Following the 1898 fire, Patterson was forced to relocate the Sheridan House to make room for a new Northern Pacific Train Depot. After the move, which also reinforced the hotel with brick overlay, Patterson renamed it Northwest Hotel. Patterson expanded his lodging empire when he constructed the Soo Hotel in 1906. 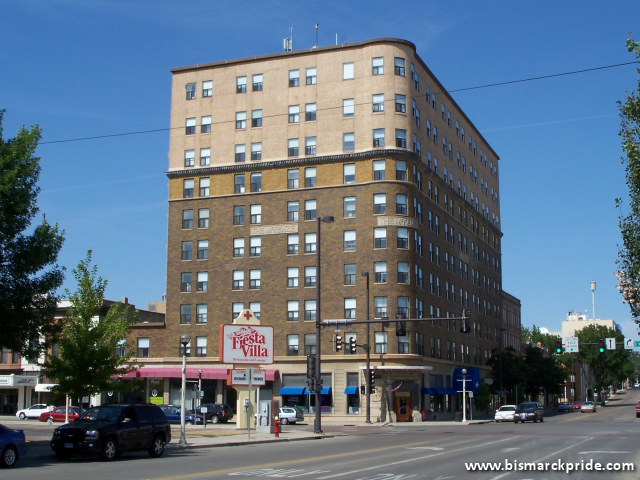 The Soo Hotel, for a short time Bismarck’s tallest building, was positioned as a a mid-class property. He also owned the Grand Palace Hotel. It was in 1910 that Patterson truly made a lasting mark on the city, when he began construction of the 7-story McKenzie Hotel (later renamed Patterson Hotel) at the corner of Main Avenue and 5th Street at an estimate cost of $150,000. He named the hotel in honor of political boss Alexander McKenzie, who was a close friend. It was North Dakota’s first building to be constructed with reinforced concrete, and was the tallest building and largest hotel located in all of North Dakota, South Dakota, Idaho, and Montana. It also contained the most private baths (84) of any building in the state. Edward Patterson passed away in November 1945. Edward’s wife, Rose Patterson, continued operating the hotel until her own death in 1975. The former Patteron Hotel was condemned five years later and underwent major renovation. In addition to his hotel business ventures, Patterson was a major real estate developer, serving as a chief rival to entrepreneur Edmond Hughes. Patterson also was owned a newspaper called The Palladium. Patterson and his properties were deeply tied to politics. Patterson himself served as mayor from 1896-1900 and 26 years on the City Commission. He was close friends to Alexander McKenzie and the principal deputy during the early years of the McKenzie Machine. Patterson’s Northwest Hotel was chosen as headquarters for the newly founded Nonpartisan League in 1915, which was moved to the McKenzie Hotel after the former’s destruction in 1921. Patterson was known as a colorful figure, particularly against his foes. In 1897, in response to ongoing criticism of colleague Alexander McKenzie and his namesake political machine, Patterson and another man, named McGahey, broke into the offices of the Settlor weekly newspaper, where they stole its printing press and dumped it into the river. The couple also delivered a severe beating to the paper’s editor. Patterson was equally as colorful against another nemesis, local entrepreneur Edmond Hughes. He renamed the Soo Hotel “Princess Hotel” allegedly as a spoof on the Hughes-owned Prince Hotel. Hughes, once a business partner of McKenzie, ultimately became a fierce opponent to the Patterson-McKenzie duo. In fact, when running against the pair in 1922, Hughes was beaten and put in the hospital for a week. Edward Patterson was married to Agatha in 1886. Their only child, Saddie, was born in 1888, however passed away just one year later. Following Agatha’s death in 1923, he was later remarried to Rose Judge Patterson.